Home / Uncategorized / Hot Dog Wars: Whose side are you on? Hot Dog Wars: Whose side are you on? 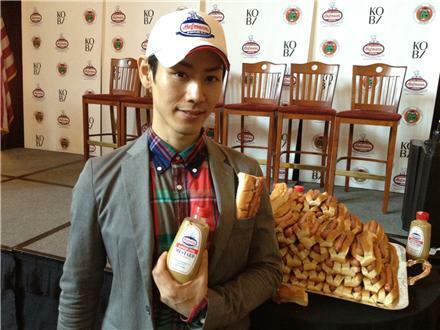 News came down yesterday that friend of the Hernia, Takeru Kobayashi downed 110 hot dogs in a ridiculous 10 minutes. Even more impressive? He invented the 'hot dog-kercheif' look that is sure to be the talk of the fall fashion season. If Kobi ever finds a way to combine this with his 'Bacon Bow Tie' look – our heads may literally implode. Nathan's champion Joey Chestnut was less than gracious in his response today on Twitter. Where do these two gastro pugilists go from here? If Joey Chestnut really did send out this tweet (which we are admittedly skeptical about) – this seems to be the first shot from the Chestnut camp sent directly at Team Kobi. Questions linger whether Chestnut got contractual permission from the monopolistic competitive eating cartel to tweet because if the rumors are true, he's only allowed to legally do and say what they approve. Thanks for sharing the informative blog.Keep on update the blog.Very nice blog. You call them things hot dogs? Guess you’ve never had a Zwiegle’s Pop Open. Now THAT’s a hot dog. You guys in Cerracuse have no clue. Hofmann’s going national due to people from around the country constantly complaining they can’t get them where they are. Pretty obvious that they are going to become “America’s greatest hotdog!” People were lined up for them at the New York State Fair. Including many from Rochester and Buffalo! Hotmann dogs are delicious! I’d even try to eat that many! ZWEIGLE’S POP OPEN SAUSAGES WILL REWAL NEW YARK IN YOUR ABSENCE HOFF MAN! Hoffman’s hot dogs and coneys are as to other hot dogs as diamonds are to cubic zirconia. There are several restaurants that serve Hoffman;s hot dogs and coneys, doing great business for decades. Any other hot dog other than a Hoffmans, with rare exceptions, are sad tubes of fat, salt, and food coloring, suitable only for stuffing the mouths of impoverished, undiscriminating 10 year olds. Hoffman Hotdogs are the best I have ever had.I have been eating them since I can remember. I believe my mother said since 8 months old. I have been all over the United States and still have not tasted a hotdog, that would come close to a Hoffman. I am so glad that they are going nationwide. At one point in time I even had a friend mail me (2) ten lb. bags on dryice for me for a special meeting. The meeting was a hitm cause of the dogs. I agree totally with Tim and Katie. Hoffam hotdogs and coneys are available nationwide. I’m originally from Syracuse so for 30 plus years that’s what I ate a couple time a month. I’m always willing to try something new but you can’t say your’s is better without trying a coney at Heid’s in the Village of Liverpool. FOR 75CENTS A HOT DOG YOU GET WHAT YOU PAY WITH NATHANS. PICK A PANEL OF 10 PEOPLE THAT EAT HOT DOGS AND LET THEM DECEIDE IN A BLIND TASTE TEST AND I,M SURE HOFFMANS WILL COME OUT ON TOP EVERY TIME. IT WOULD BE A GOOD TEST FOR SURE. OK BRING SWIEGALS IN ON THE TASTE TEST TOO, BETTER YET BRING THEM ALL AND HAVE 25 PEOPLE TRY THEM.